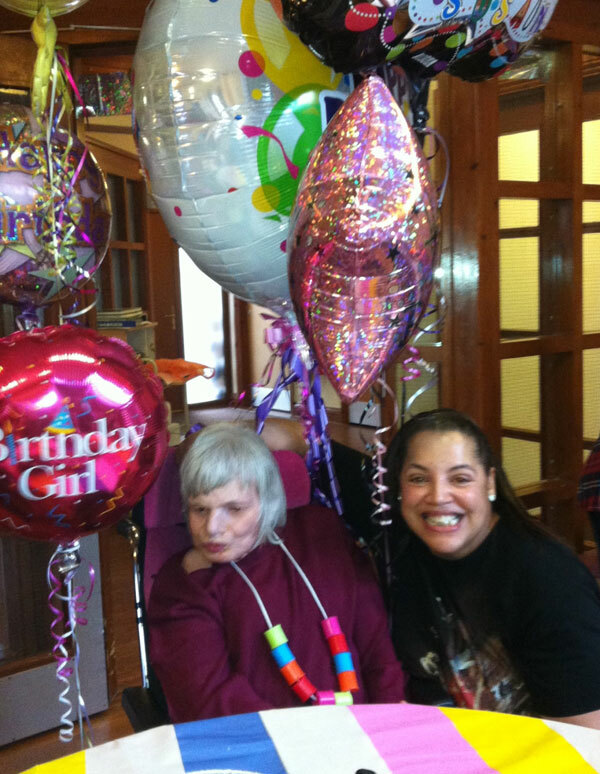 When Woodcock Dell resident Susan sadly passed away in January, the home’s staff arranged a poignant service to celebrate her life and the role Norwood played in it. Here we describe the impact she had on those who knew her best. In the eulogy given at 72-year-old Susan’s cremation on 22 January, prepared by Susan’s key worker, Sharon Hawkins, and other staff at Woodcock Dell, the officiating Rabbi said: “As we all know, there were things that Susan couldn’t do. She couldn’t walk. She couldn’t talk. She couldn’t do many things other people take for granted every day. Watching Sharon and Susan together at Woodcock Dell’s Chanukah party, just over a month before Susan passed away, it would have been clear to anyone just how close the two of them were. Despite Susan being non-verbal, Sharon found a way to communicate with her in what she describes as “Susan’s own language”. “We had this personal connection, which meant I could read her gestures, sounds and expressions and knew what she wanted or needed,” she says. When Susan lost the ability to chew and doctors recommended that she be fitted with a feeding tube, it was Sharon who fought for her right to try a different approach. “I was worried that she would pull the tube out and open the way for infections,” she says. This meant that at every meal time, Sharon would puree and process Susan’s food until it was precisely the right consistency to feed her. Despite the high degree of dedication required for this task, for Sharon it was all part and parcel of “doing everything properly” for someone she regarded as her own family.